Runners: What is FITT? and why should you know..
FITT- Its so important and no matter what sport you are in to, we always look closely at yours. Frequency, Intensity, Time and Type. Have you ever said ‘I am just not capable of running a Marathon’. Chances are injury is the reason. What was it that really lead you to injury. Was it the fact that to make the marathon you needed to run 4-5 times per week (frequency) and you knew that your body just does not back up for a run 2 days in a row. FITT is a way of measuring the type of loading that you are asking your body to put itself through. And like anything, some people suit one type and some suit others. For example some can back up and run day after day no problem, but cant seem to run for over an hour or a particular distance without breaking down. It all comes back to loading- long runs, hills, flat runs, fast runs, trail runs, regular runs, random runs all cause different physiological changes and adaptations. The good news is there are answers, so no one should really be able to say ‘I am just not capable of running a Marathon’. Come and see us for a running assessment, or to get that injury sorted out. Call 9521 7578 to book an appointment. 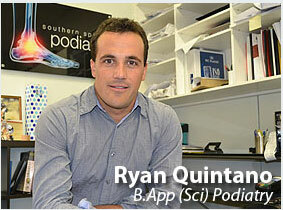 Southern Sports Podiatry specialises in foot injuries, orthotics, sports orthotics and biomechanics. Located in Sutherland, Southern Sports Podiatry treats everyone from high level runners and triathletes, to weekend sporting warriors. However, if you are just suffering from foot or ankle pain and are looking for answers then contact us today.